I always believe that good Chinese food can never be replicated at home. Our palate has been assaulted by MSG and extra salt in every Chinese restaurant, that we have now acquired a taste for it! That’s why every time I try Chinese at home; I’ve already resigned myself that the recipe is going to be equivalent to a pirated DVD! My fear of ODing on MSG and Salt has prevented me from achieving greatness in my quest for restaurant Chinese. (By restaurant I don’t me the fancy 5 star’s…am sure they go easy on the MSG). Am I sad? Au contraire… I actually like the fact that I can indulge in dangerous liaisons only once in a while (OK, I actually eat Chinese almost once a week… but you get the drift!). Coming to the point … this Stir-Fried Vegetable recipe is really easy and tasty. (Cross my heart!). It takes care of the mid-week Chinese craving quite well. Toss in some Chicken or shrimp if you fancy and you’ve taken it to another level! P.S. Here’s some advice I nicked off the net about Chinese Cooking. It works!! 1. Preheat the wok (before you put the oil in). 2. Season the oil (with whole pieces of garlic and sometimes ginger root, which you often remove when you add the food to be cooked). 3. Symmetry of cut (all pieces must be cut the same size and shape). 4. Have all ingredients cut and sauces mixed before you cook. 5. Use very high heat and cook fast. 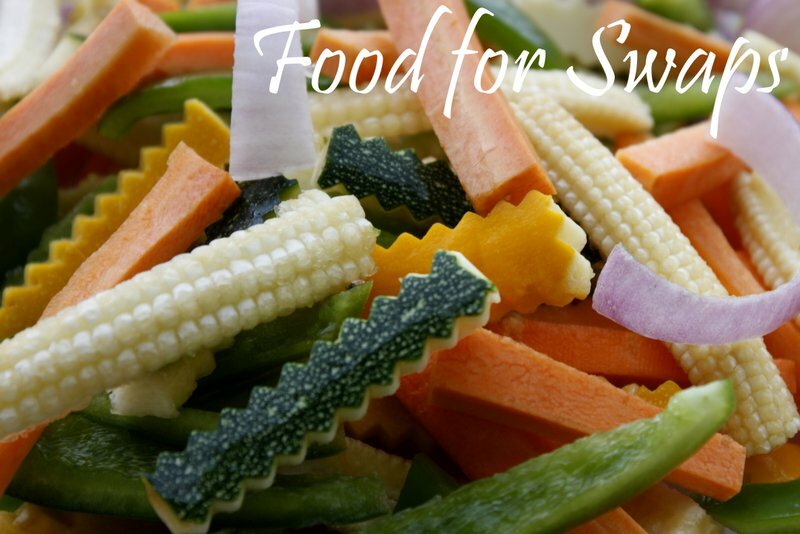 Cut vegetables into pieces that are the same size and same shape. (thick Matchsticks). 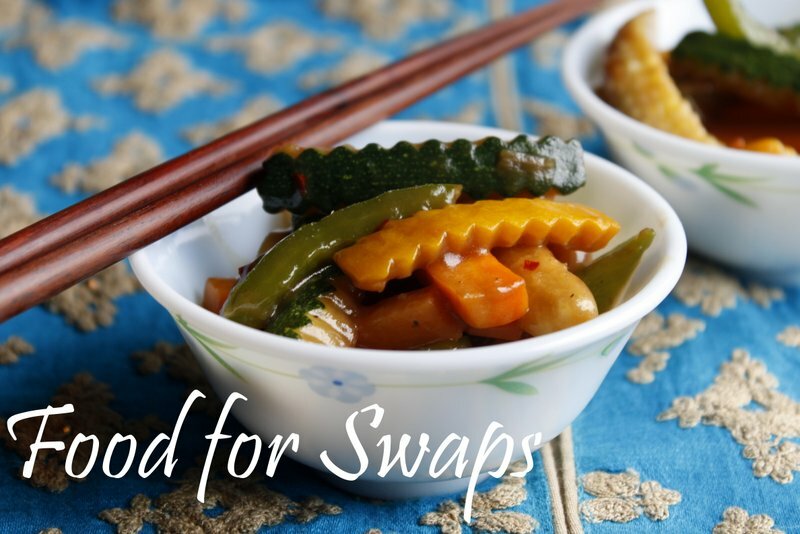 Get oil, soy sauce, salt, cornstarch mixture and measuring spoons out and have them ready on the counter near the stove. Put wok or frying pan on the stove and heat 1-2 minutes, until it’s too hot to hold your hand over it. (You should be able to almost see the heat shimmering up from the wok.) Add the oil and heat about 30 seconds, then add sliced garlic and sliced onion and cook 20 seconds, stirring constantly. Add the rest of the vegetables all at once, add salt, and cook 4-5 minutes, stirring every 20-30 seconds, or until vegetables are barely starting to soften. Add soy sauce, stirring gently so all the vegetables are coated with sauce. Cook about 1 minutes more, stirring a few times. Stir in the warm stock and gradually mix in the cornstach mixture. Stir to combine. Bring to a boil and cook and stir for 2 minutes or until thickened.Sprinkle with pepper and chilli flakes. Mix and Serve hot! Swapppy I have tried almost all veggie recipes off u r blog man! My fav is the PBM 😉 awesome awesome! BTW how did u do the fancy cutting?? is it some sort of knife? I use Peanut or sesame for chinese… it does impart a special flavour. But more importantly – it has a higher smoking point, that allows for cooking at higher temperatues – which is what stir frying is all about. Previous PostOnion Pakodas – For the Rains!